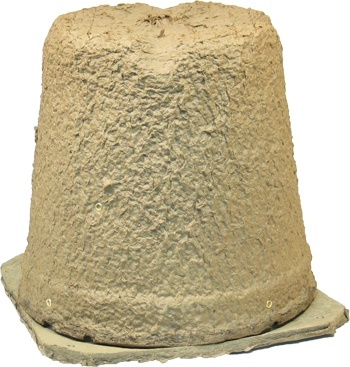 The Cone Style Trap is a large "flower pot" style container that is made from wood pulp. Set the trap high up in a tree and with the help of bee pheromones you will be able to capture a swarm. The bees will enter through the hole at the end of the bucket and once you are ready to remove, the bucket detaches from the base. With this style trap, you want to check frequently as the captured swarm will create a seal between the bucket and the base and begin to draw out comb.